The legends of the Masters are in full force in this lively look at America’s golf classic. From Bobby Jones and Gene Sarazen to Arnold Palmer and Jack Nicklaus to Tiger Woods and Phil Mickelson to Bubba Watson and Jordan Spieth, all the greatest Masters moments of the greatest, and not so great, golfers are here in one book. "The rise of the Masters, the youngest by far of golf's four major tournaments, is one of the great stories in American sports," writes Sowell. "The game's other three major events - the British Open, the United States Open, and the Professional Golfers' Association of America Championship - were first played in 1860, 1895, and 1916, respectively. During the first full week in April when the tournament annually takes place, millions of Americans who ordinarily can go right on living, even if they confuse a nine-iron with scrap iron, suddenly become consumed with golf, golfers, and Augusta National. As for the millions of golfers and golf fans, it has been said there is a consciousness of the Masters in the air every day of the year. "Because the Masters is the only one of professional golf's four major tournaments with a permanent home, the game's greatest players have played more holes of major championship golf at Augusta National than at any other course in the world. In the process they have executed some of the game's greatest shots and have also on many occasions been humbled beyond belief. "Each of the eighteen holes on Bobby Jones's masterpiece is named for a plant or tree that adorns it, and they have all made their mark on what has been so aptly called 'the tournament like no other.' 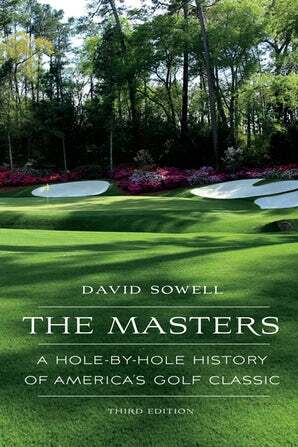 This book will chronicle each of the individual holes' contributions to the excitement, pressure, heartbreak, and exhilaration that is the Masters." This third edition provides a rich historical view of the course where success breeds legends and where failure can haunt even the most brilliant golfer’s career. He has updated each hole with additional stories of greatness and tales of woe for a new generation of golfers led by Jordan Spieth, Rory McIlroy, and Patrick Reed, as well as from an older guard represented by Bubba Watson, Adam Scott, and Sergio García. In the chapter titled Hole No. 2, Par Five - 575 Yards - Pink Dogwood, Sowell writes, "Every player who steps onto the tee at the second hole is thinking birdie at this dogleg-left par five , although it is the longest hole on the course. From the tee the fairway slides gradually down until, approximately 300 yards out, it takes a left turn at the crest of a very steep slope. The elevation drops some 90 feet from tee to green, but most of that descent occurs in the last 275 yards. This hole originally measured 525 yards. Its distance has been increased several times over the years. The last lengthening came before the 1999 Masters, when it was stretched from 550 to 575 yards. "If a player opts to take the short route down the left side on his tee shot, he must guard against getting into the woods, which are just off the fairway. Also he must be aware of the ravine that is concealed behind the trees that has swallowed up the holes of many a Masters participant. "In the final round in 2003 Phil Mickelson made a remarkable recovery after pushing his drive into the pines on the left side. The errant shot left him with an unplayable lie. After taking a drop, he took out his driver with the hope of reaching one of the bunkers in front of the green. With his ball sitting on pine straw, Phil hit a perfect cut shot, and to his own surprise the ball reached the front edge of the green. He was still ninety feet from the pin, but after studying the putt at length, the followed up his remarkable recovery shot with a remarkable putt that did a little ring around the lip of the cup before falling in. Mickelson, who was 0 for 42 in majors for his career, was now just three strokes off the lead at that point. When that putt dropped for a birdie, he looked skyward as if to ask is this going to be my year? But he would have to wait twelve months for that first major title and a green jacket, as he would finish the day in third place, two strokes out of first." If you are a golf fan or enjoy watching this tournament that is the unofficial start of spring, The Masters is one of the best books on the sport and this tradition.